Letter from Henry Drinker to President Woodrow Wilson, December 20th, 1913. An exchange between Henry Drinker, President of Lehigh from 1905-1920, and United States President Woodrow Wilson illuminates one side of the conservation battle in the early 20th century. 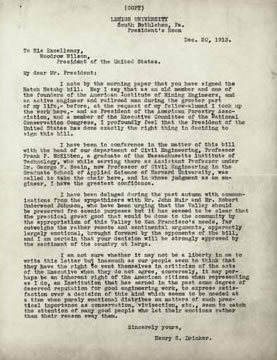 In a letter to Wilson, Drinker praises him for signing the Hetch Hetchy bill. The bill related to a movement in San Francisco to secure the scenic Hetch Hetchy Valley in Yosemite National Park as a site for the city reservoir. Although John Muir bitterly opposed the plan for years, Congress finally passed the Raker Act in 1913, which allowed for the controversial dam to be built. Drinker calls the arguments of Muir and others "remote and sentimental," and outweighed by the "practical great good" of the project. Wilson wrote back, thanking him for his support. What did "conservation" mean in the early 20th century to men like Henry Drinker and John Muir?